John McKee Jamison bought two lots in Myers Park on September 1, 1911, for what was then the large sum of $8,352. Jamison owned and operated the Stonewall Hotel. The Stonewall stood right next to the Southern Railroad Passenger Depot on West Trade St. He also owned a hotel in Henderson, N.C. and was a director of the Charlotte Commercial National Bank. A native of Mecklenburg County, Jamison had returned to Charlotte in 1908 and was obviously a man on the way up. That’s why he was one of the first homeowners to move his family from Uptown to Myers Park, Charlotte’s fanciest streetcar suburb. Lucille Price Whitley Jamison, also of Mecklenburg County, was John Jamison’s wife. She and her five children no doubt rode the streetcar along Queens Road or accompanied Mr. Jamison in his fine automobile to watch their grand new home being constructed. The contractor was J. A. Wilson, whom the Jamisons had met in Hamlet, N.C., where Jamison had managed the Seaboard Airline Hotel. 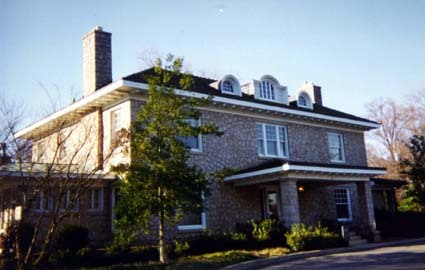 The architect of the John & Lucille Jamison House was Charlotte architect Louis Asbury. Built in 1912-13, the structure is a handsome two-and-a-half story structure composed of North Carolina granite laid like rubble in an uncoursed cobweb pattern. The massing or overall shape of the house is quite simple. The Jamison House is essentially a rustic cottage expanded to the scale of a Neo-Classical block. The interior of the house, which was slightly altered in 1978 by Charlotte architect Richard Gillespie for use as a bank, is magnificent. It is trimmed throughout with superb oak and cherry woodwork, fine mantels, and, on the second floor, with milk glass bellflower light fixtures attached to metal bases. Tragically, John Jamison did not live to enjoy the splendor of his Myers Park home. On a Sunday afternoon drive in his luxurious car on June 27, 1912, Jamison started across the railroad tracks in Newell and stalled. Lucille and the children got out, but the massive steam locomotive crashed into the automobile, killing Mr. Jamison while Lillian looked on horrified.